We share the ancient mysteries, the feelings lost, forgotten dreams, unseen for ages now beheld in wonder. Once you arrive at Skyhold in Dragon Age: Inquisition, everyone finds a niche for themselves, and Solas takes up residence in an elegant round tower room on the ground floor. 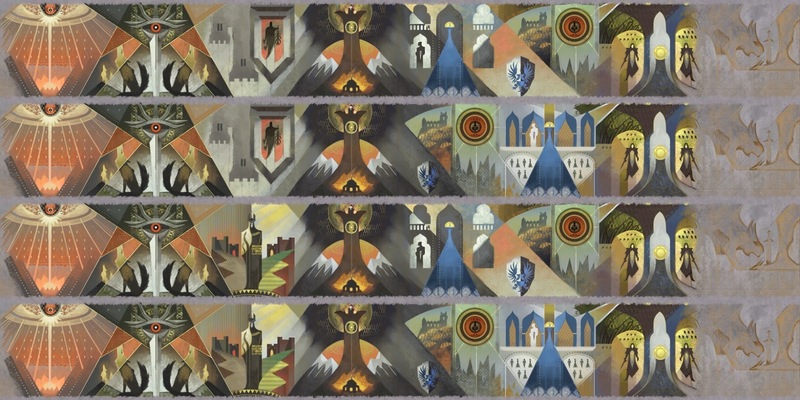 Solas's ancient and beautiful fresco paintings, which progressively fill the walls of his round tower room as the story moves forward, actually tell the story of the Inquisitor, and each panel reflects a major choice or decision the Inquisitor made so far. What's interesting about Solas's paintings isn't just that they tell the story of the Inquisition—they will actually change subtly from playthrough to playthrough, depending on decisions you make. PANEL 4: Corypheus rises, and Haven is destroyed. PANEL 5 (ALT): The assassination of Empress Celene (if done before "Here Lies the Abyss"). Notice that Celene is dressed as she was at the Ball at Halamshiral. PANEL 6 (ALT): The assassination attempt against Empress Celene, if done after "Here Lies the Abyss." As before, notice that Celene is dressed as she was at the Ball at Halamshiral. PANEL 7: The Temple of Mythal. Note the presence of Abelas and the Well of Sorrows. The arch may also represent Mythal's last Eluvian. For a gorgeous examination of the technique Solas would have used to create these frescoes, I highly recommend checking out the "Let's Talk Solas's Frescoes" blog post from "Sulahn Enasalin," The post goes into great detail on the classic techniques for creating frescoes like Solas's, and it's fascinating and intricately researched. "The frescoes are his gift to the Inquisitor and/or Inquisition, a representation of an art barely known or remembered in modern Thedas, telling the Inquisitor’s story, applied with painstaking craftsmanship and dedication. It’s His Gift, something he gives even to an Inquisitor he truly dislikes." As a Solas romancer (or "Solasmancer") I also find something lovely in the idea that Solas paints these images as a gift, true, but perhaps also as a way for him to express his feelings. I also can't help but feel that there's something else to the murals. Knowing who Solas truly is—I feel that the frescoes are also Solas's attempts to rejoin the world and to regroup, to try to analyze and understand the strange and upsetting reality in which he now finds himself. So he leaves us with a gift that he never mentions and never discusses—and none are required. The gift is there on each wall before our eyes. I find that really lovely, subtle, and very true to Solas. Solas also leaves a final fresco (unfinished) at the end of DAI. Note that you can only see it if you go to his room after defeating the game. First off—why is it unfinished? The simplest answer is that Solas was interrupted at this work when Corypheus attacked. However, I also wonder if it isn't unfinished because of Solas's own ambivalence. He has grown to love and care for the people of the Inquisition -- and certainly for the romanced Inquisitor, even after he broke things off (sending my own poor Lavellan off to a period of permanent weeping and residence at the bottom of a booze barrel at the Herald's Rest). He is filled with regret at what he believes he must do next -- departing the Inquisition, meeting with Flemeth/Mythal (taking her life force, which I believe she gives him voluntarily), and beginning his plans anew to tear down the Veil. Meanwhile, what does this unfinished panel mean? As a rough depiction of a wolf standing over the stabbed body of a dragon, it may, first and foremost, signify our victory over Corypants and his dragon. 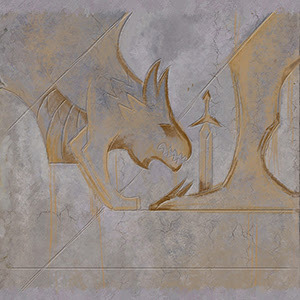 But as the dragon also certainly resembles some of the elven depictions of dragons like those in the Temple of Mythal—it might also be Solas foreshadowing Mythal's fate to come. It may also be the wolf mourning the dragon's death (which is how I see it). It can also be a message from Solas to a romanced Lavellan, in which he mourns the future ahead of him (and that he must leave). I see a lot of regret in the image, myself. Lastly? I think it's a big-picture message—a sign from Solas that the story is not over. In other words, we will see him again. And we certainly do.